Manitoba announced 403 invitations to immigration applicants in a draw conducted on April 11 by its stream of Skilled Workers Overseas. The Skilled Workers Overseas stream is a vital part of the Manitoba PNP, which enables the province to choose a fixed number of economic immigration applicants for Canadian PR each year. The April 11 draw announced 352 invitations to two groups of applicants, including an unknown number with a profile in the Canada Express Entry system. The Federal Express Entry system runs the pool of applicants for three major economic immigration categories of Canada — the Canadian Experience Class, Federal Skilled Trades Class, and Federal Skilled Worker Class. Express Entry applicants with a nomination of the province from Manitoba receive an extra 600 points for their Express Entry CRS ranking score and are completely assured an invitation to apply for permanent residence to Canada. To be recognized for Manitoba provincial nomination, Express Entry aspirants need to present a separate profile of Expression of Interest to the Manitoba PNP. Suitable E.O.I profiles are provided a rank depends on scores granted for factors that comprise educational background, age, work experience and a applicants connection to Manitoba. The highest-ranked applicants are then invited to appeal for a provincial nomination by regular draws from the pool. Express Entry applicants invited in the Apr 11 draw were expected to have a genuine ID of Express Entry and validation code of job-seeker, and minimum 06 months of latest work experience in a profession listed as In-demand by the Manitoba PNP. Minimum language ability in French or English of C.L.B/N.C.L.C 5 unless the work experience is majorly in a regulated profession, in which case the demand is a minimum of C.L.B/N.C.L.C 7, or a necessary trade, in which case the minimum is C.L.B/N.C.L.C 6. The lowest-ranked applicant in the above two groups had a score of 561. 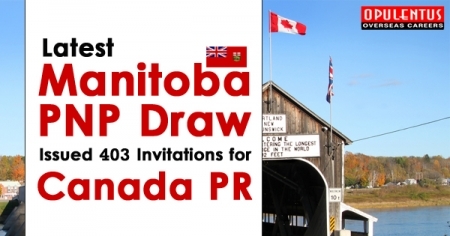 The Apr 11 draw also announced 51 invitations to applicants by one of the M.P.N.P’s Strategic Recruitment Initiatives. These include abroad recruitment missions managed by the Manitoba PNP in partnership with Manitoba businesses. The lowest-ranked applicant invited by a Strategic Recruitment Initiative was 695.